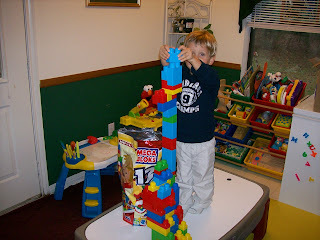 Dawson loves building tall towers with his blocks (mainly because he can knock them down once he's completed them). 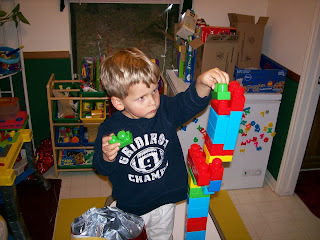 Randy bought him a giant bag of 120 mega blocks, which allowed him to build the tallest tower he's ever built. He had to climb up on the table in order to continue the building. He's so intent in his building.